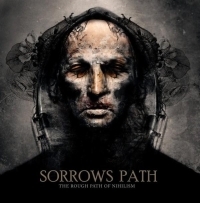 The complex and technical music of Sorrows Path goes beyond your typical Epic Doom Metal. Since their re-activation, Greek Doom Metallers Sorrows Path have presented themselves as really hard-working band, making careful steps in the underground. First, it was the re-release of their early demo recordings from the 90s on ‘Resurrection’, secondly their selective live appearances in various locations and, thirdly, their latest album 'The Rough Path Of Nihilism' on German Rock It Up Records. The opus marks a new chapter in the band's saga and it's actually the result of three years of absolute commitment to compose and record the twelve songs of this masterpiece. If you are familiar with Sorrows Path from their early demo days, or from ‘Resurrection’, you should already be aware that Sorrows Path are actually creating a very special, unique sound of their own, exploiting Doom Metal standards through a more complex and technical playing. The concept is almost the same as in their latest album. You can clearly hear the Doom Metal riffs, the dramatic melodies and the crystal clear vocals - features that would be inevitable on every Epic Doom Metal record you could think of - but in Sorrows Path's sound we also find those double guitar melodies, complex rhythm parts and adventurous tempo changes that make their music go beyond your typical Doom Metal. Roughly, we are dealing with a mix of Doom, Power and Prog Metal, everything under the dark prism of Sorrows Path. 'All Love Is Lost' starts with an acoustic interlude, opening for an expanding riff à la Crimson Glory, while its main part is marked by a mid-tempo Doom riff and the haunted voice of Mr. Angel Ioannidis. Yes Ladies and Gentlemen, this is an outstanding mid-tempo anthem! And let me point out that it is showing its power mainly in the chorus, which is one of the best parts in the song. A more careful listening should bring to the foreground the magnificent leads and the very special, complex and daring rhythm section that is an extremely strong aspect throughout the album. Stavros Giannakos on the bass-axe and Fotis Mountouris behind the drum-kit have done an excellent job. The chorus of 'The Beast' is probably one of the most memorable in the entire record (yes, it is actually another track having a chorus that will stick in your mind like the first one, but in 'The Beast' the chorus is the song's name). Both tracks are for sure excellent 'live tracks': their entire force can be shown on stage. 'Dirty Game' is probably one of the heavier songs that the band has written - both musically and lyrically - and on their live shows they actually add some growling to its chorus and it really rocks. In 'Queen Of Doom' and 'Prostitute', the band gives some lessons in excellent riffing. I first heard 'Queen Of Doom' during their support gig to Solitude Aeturnus and I was left simply speechless. This is already a Sorrows Path’s classic. Excellent riffing, magnificent leads by Mr Kostas Salomidis and a deadly atmosphere spread all over the song. 'Prostitute' is the silent tribute of the band to Black Sabbath. Listen to its main riff and you should get the point; another killer tune here. 'Empty Eyes And Blackened Hearts' is the best song of the entire album. I have found myself listening to it 20 times in a row, each time getting more and more addicted to it. Great starting melody, great main riff and chorus, great lyrics. Cleverly, the band selected this one to be their first video clips... check it out. I have started by pointing out my favourites tracks and I've ended up pointing out almost half of the record! I could have written even more about each track, but enough is enough. The main point is that 'The Rough Path Of Nihilism' is for sure an album not to be ignored. If you are into Heavy Doom Metal, this should be the next piece in your collection for sure, and, moreover, this could be a fine album for you if you are still looking for some complex and technical steel. Before I close this review, let me add that the production is crystal clear and heavy, doing justice to the music on the CD. Finally a big “kudos” to the band for offering us such a great album.